Will Hummingbird Syrup Harm the Bees? 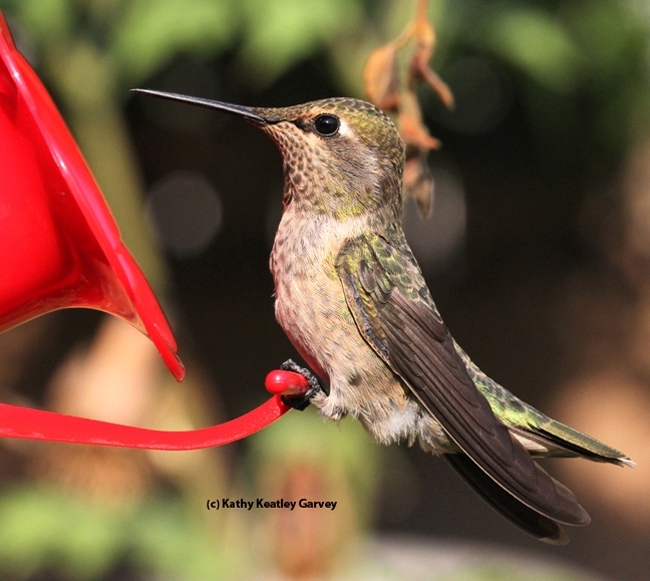 It's no secret that honey bees like the sugar/water mixture in hummingbird feeders. If there's no bee guard on the feeder or if the feeder isn't bee-proofed, bees will sip the mixture. They also will lick the spills. A sudden gust that sways or upends the feeder is "bee happy time." However, should we be attracting honey bees to our hummingbird feeders and/or providing them with sugar/water syrup? Is the syrup mixture good for the bees? One rural East Bay Area area resident who feeds the hummers and caters to honey bees in her garden asked that very question. Since bee guards prevent the short-tongued bees from reaching the food (hummers, as we all know, have long tongues), she hung "plant saucers from a tree with sponge in one and a terrycloth towel in the other so the liquid doesn't cause them to drown, and the bees swarm all over it to eat the sugar water. I can go through two gallons of sugar water a day. Who knew bees could eat so much." "Bees are in trouble elsewhere but not here," she shared. "I didn't intend to be a bee feeder. I don't have hives for them or collect their honey." The bees come to eat and she enjoys watching them eat. Her intention is to help the bees. "Walking into a swarm of bees to fill their feeders is thrilling. I don't hurt them and they don't hurt me. And having them here is a simple way for me to educate people about the importance of bees and contrary to the common belief that we need to be afraid of them. People leave here with a different view of their gentleness and importance." She makes a 3-to-1 ratio (three parts water, one part sugar) for the hummers and bees. However, her neighbors wonder if she is harming them "because they need the protein from pollen" and the bees "might find the sugar water addictive." Newly retired Extension apiculturist Eric Mussen of the UC Davis Department of Entomology and Nematology has answered a lot of humminbird feeder/bee questions during his 38-year career. "Feeding honey bee colonies sugar syrup has been going on since man determined how to refine sugar from beets and canes," Mussen said. "However, in most cases, we feed these syrups to honey bee colonies only when they are short on nectar at times when nectar is critically important, especially for brood rearing in the spring and for making sure there is enough food in the hive to get the bees through winter." "Nectars contain very small amounts of numerous plant-derived micronutrients that are essential to honey bees," he pointed out. "We have known that all along, but recently some research has documented that components of honey make the honey better for bees than sugar syrup. Honey-fed bees have more robust immune systems, they learn locations of food sources more rapidly, and they forage more quickly than sugar syrup-fed bees." So, the question: Is she harming the honey bee colonies with the syrup feeders? "I doubt it," Mussen said. "Some beekeepers feed hundreds of colonies from open buckets of sugar syrup in southern U.S. beekeeping operations, and their colonies do just fine. However, I counsel against such an approach, since the strongest and least needy colonies get most of the syrup, leaving little behind for the weaker, more needy colonies. Each should be fed individually with a hive feeder." So bottom line, "If you wish to continue feeding the bees, they will keep taking the syrup. However, since it is not nectar, the bees will be 'robbing' the syrup from its source. The problem with that is that once robbing gets started, bees from one colony begin to try robbing from neighboring colonies. The bees fight at the entrances and many are killed. I am sure that we can say that many colonies are benefitting from your syrup in one respect--just like the hummers--but there are downsides to the practice." 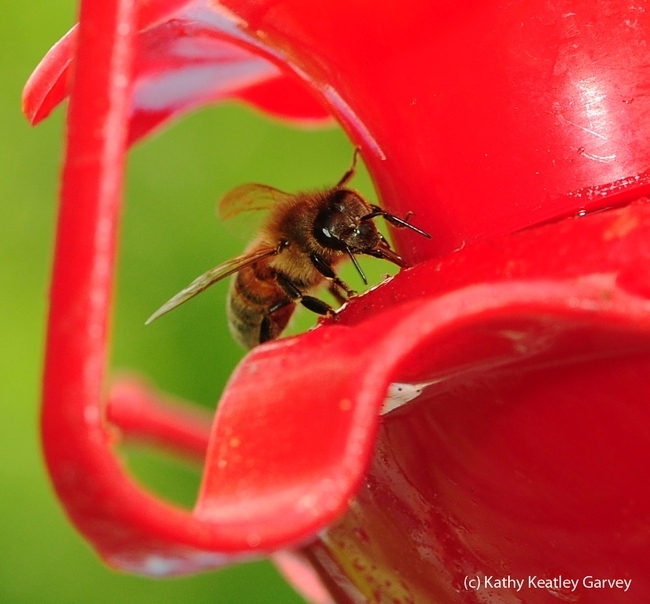 In addition, beekeepers may find their honeycomb tinted red or polka-dotted. It's not honey; it's syrup. I use only clear hummingbird syrup in my feeders just in case I or a squirrel knocks one of my feeders over. It won't take honeybees long to find that mess and when they do they'll be all over it and in mass numbers. The only issue I've found is if honeybees get into too much red-colored humming bird syrup they'll store it and you can end up with red or reddish-colored honey. The flavor of the honey doesn’t really change, it's just diluted a bit. Pure nectar is best for them and hummingbirds. So keep as many hummingbird friendly flowering plants around to provide a variety. Thanks so much for this article. This was my exact question. When bees started taking over a hummingbird feeder, I put out a small container in the same tree with a diluted sugar syrup and clear glass pebbles as landing pads. They drank from the new cup but continued to want the stronger sugar solution at the feeder. Within a few days, I saw the bees starting to fight over the feeder and attack each other. I just removed the feeder after gently spraying it off with water to remove the bees. I'm leaving the diluted sugar water cup for the moment but will take it down later today. I think maybe the feeder is leaking. Thanks again!